1 Yard of 10mm Flat Navy Blue Leather Strapping. This range of leather strapping is useful for practically minded people, who have a broken handbag strap and who are happy to mend it themselves. 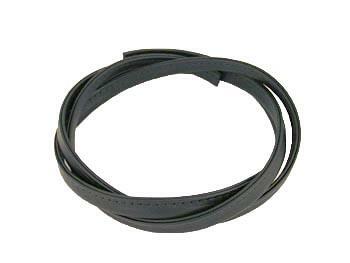 This flat leather strapping is widely used on handbags. This version is navy blue and 10mm wide.It has a nylon core and is stitched along one edge to stop it from stretching. As this item is sold by the yard, it is necessary to enter the number of yards you require, when asked for the quantity. The quantity window is on the page which appears, once you have clicked the 'add to cart' button. If for example you enter '3', you will receive a 3 yard length of strapping.